The Press and Journal carries the PM’s comments on yesterday’s announcement and says the £6m package will compensate troops on the ground from tax rises by the Scottish Government. In a short side bar, The Scotsman also focusses on the PM’s announcement. Meanwhile, the Sun carries a small piece saying that the Defence Secretary is protecting troops from Scottish Government taxes. Our Armed Forces are deployed where they are most needed and so it is wrong that personnel are penalised or left hundreds of pounds out of pocket because of decisions taken by the Scottish Government. As a result of this decision, I am extending the financial mitigation package for serving personnel in Scotland for another tax year. This demonstrates our commitment to treating all personnel both equally and fairly, wherever they serve. In a double page spread, the Daily Mail headlines the story ‘Arrivederci to a hero’. The paper goes on to look at John Henry “Harry” Coates’ career, noting that he gave up a leave day to join his RAF squadron on a mission to liberate Italy from the Nazis. It was his final flight. The paper says the hero ‘finally got the send-off he deserved’ yesterday at two poignant ceremonies in Italy. The Revd Dr (Gp Capt) Giles Legood’s comments and a family statement is carried. In another double page spread in the Daily Express, the paper says the ‘entire village’ where the crash was found turned out to pay their respects to WO Coates, standing side-by-side his family and RAF personnel. British embassy military attache Wing Commander Pete Cochrane’s comments at the burial are carried. The paper also carried a side bar piece written by the family about WO Coates. The Times also carries the story, saying RAF personnel from RAF Halton carried his coffin following a military parade, while The Telegraph notes JCCC’s work to identify and trace the serviceman . The Sun and The Daily Mirror also carry short pieces and a picture of the coffin being carried by RAF personnel. It is a great privilege to be here today to see WO Coates finally laid to rest, particularly in the presence of so many of his family. I’m delighted that we have been able to identify him and bring his particular story to an end. All of us chosen to represent the RAF have an important part to play in this significant occasion. I am honoured to be able to show, through the words of the funeral service and through our actions, that every member of the RAF is remembered and valued as a child of God. 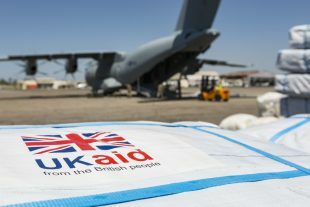 Image of an RAF A400M Atlas aircraft, seen here at Beira International Airport in Mozambique, where RAF personnel and charity workers worked together to offload the aircraft quickly and effectively.